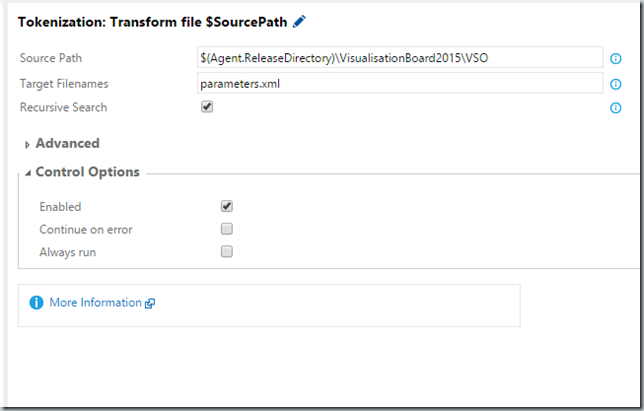 Yesterday I migrated one of our TFS collections to VSTS using Microsoft's migration guide for moving from TFS to VSTS . I won’t lie, it was a pretty long process and it took a lot of going back and fourth to make sure I fully understood the guide which is a PDF 58 pages long. The guide comes with several checklists and things you need to check and prep before your migrations. A very rough outline of what happens is that you run a check against your TFS using the tool provided to ensure everything is exportable, if there are problems you go about fixing them following suggestions from the tool and then running the check again until you are ready to go. Next you you will run a prep that will generate some files you will need to map your users across followed by making a database backup as a DACPAC package and entering your import invite codes (provided by Microsoft). 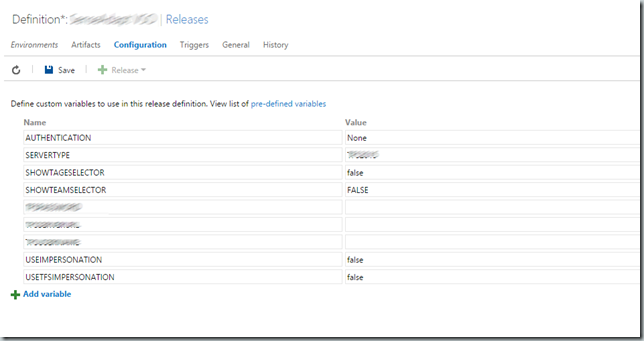 These are then uploaded to an Azure storage account and you kick off the migration process which uses these assets to import your data into a brand new VSTS instance. 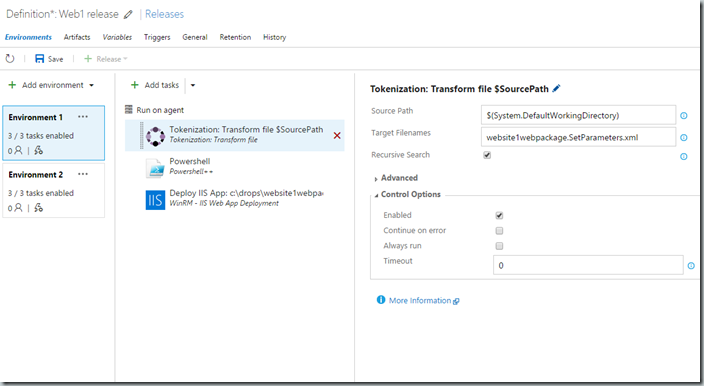 I won’t go into details about how to do the migration as this is covered in the guide, however I will highlight some things you should take into account before you migrate from TFS to VSTS which is done using a tool provided in the guide called the TFSMigrator. You are going to have to make sure you have this in place or have at least thought about it. If you use Active Directory in your organisation a good thing to look at is replicating this to Azure, your migration is going to need this. If you are not using Active Directory but just accounts on the box as I did for this migration, you can easily map these across to Azure Active Directory accounts. If you have Office 365, then you already have access to an Azure Active Directory setup (depending on your subscription) and you can make use of this. The reason Azure directory is important, is that this is how VSTS will authenticate your users once you have migrated across to VSTS. Even when doing a test migration as I did, you need to plan for some downtime. One of the reasons for this is that you will need to generate a DACPAC project of your TFS Collection. In order to do this you have to take the TFS Collection Offline and then detach it from TFS. If you have not done this before you may be put off by the ominous warnings from the TFS Admin Console asking you to tick a box stating you have made a backup of your TFS databases. After you have detached your TFS Collection and made a DACPAC of it, you can then reattach your collection so your team can continue working as usual. Yes I had never used one before. The guide will give you some details with a sample command line to use to create one. Effectively DACPACs are short for Data-tier Application Package. These are generated from SQL Server itself. It is basically a way of exporting your whole TFS Collection database with everything that it needs to be re-created. “tables, views, and instance objects, including logins – associated with a user’s database”. The DACPAC package will be uploaded to an Azure storage blob that the migration tool uses. While I have used Azure Storage Accounts before , I found this part quite complicated and it took me a while to get it right. Basically the DACPAC package your create from your TFS Collection database gets uploaded to an Azure Storage account along with a mapping file for user accounts. The hardest part I found was having to workout how to create an SAS token URL to the where I had stored these in an Azure storage account. The guide will provide you with a link to some PowerShell you can sue that will generate this URL for you. I am not sure why Azure couldn’t create this link for you (I did try) but eventually used the PowerShell provided that worked first time. Make sure you have the Azure PowerShell tools installed, you will need these for running some PowerShell to generate an SAS token url to your Azure Storage account (see above). I would recommend reading the guide fully before getting started. Also note that currently you have to request an import code in order to use the service. You will get two of these, one is for a dry run to ensure it works and the next one is for your production import. This is when you are fully committed and feel confident it all went to plan in the dry run. 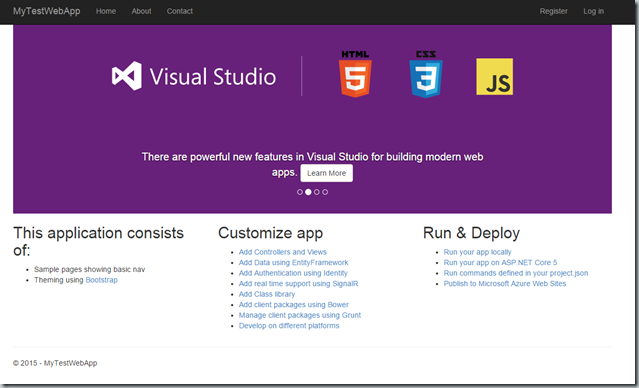 It has been a while since I last blogged about MS Visual Studio Team Services Release Hub. The last time I blogged about Release Hub the product was very much rough around the edges and quite a few of its parts were in early preview. The sample I have put together here is more for my own reference. But if you have any suggestions or improvements I would love to hear from you. I will try to expand on this article a bit more with more examples that don’t fit the norm in future blog articles. The scenario I am going through here is an ASP.NET website that is created from a build and that same build needs to be deployed to more than one environment with its configuration changed for each environment. Before you can deploy a web project you need to prepare your project for deployment. 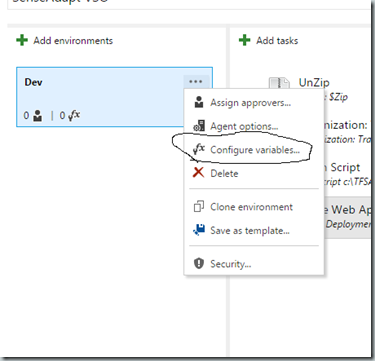 You may have already used this functionality to deploy directly to an Azure website from Visual Studio or to an on premise server. 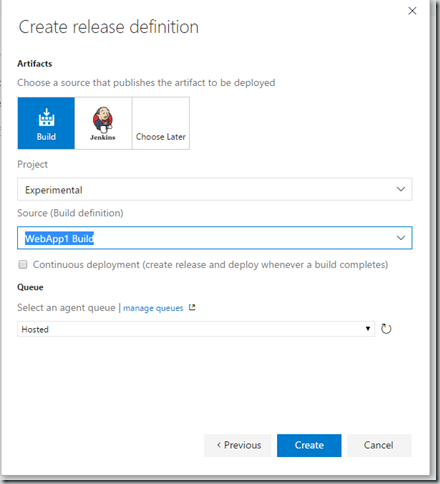 This functionality can also be used to help create deployment packages that we will use later with Release Hub. Right click on your web project and select Publish. Don’t worry this wont publish your site but it will enable us to setup a deployment profile for it that we will use later. In the dropdown box that appears next select “Web Deploy Package”, here type in a name for your deployment package. 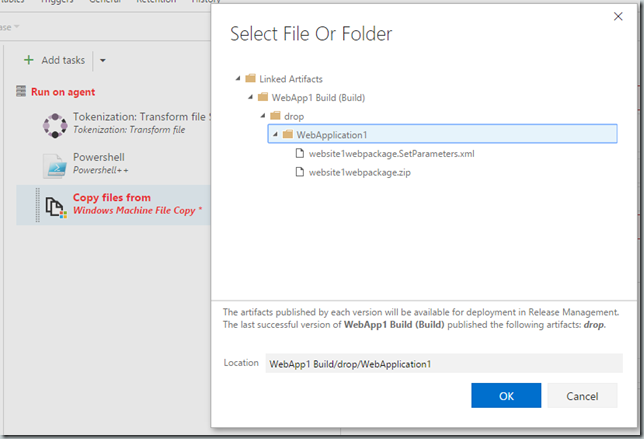 We will be using MS Web Deploy to deploy our site later but in order to do this we need to set our site up to create a deployment package. In addition to this we are placing in a token called __SITENAME__ this will be replaced later at deployment time when we actually deploy our application. I will talk more about this later. Here the publish wizard will display any database connections string which you can also replaces with tokens of your own. Tokens start with “__” and end with “__” and are in capitals. 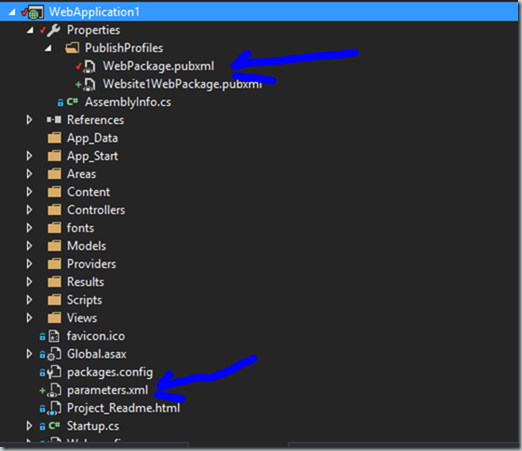 We are only really interested in the website1.webpackage.SetParameters.xml and in website1.webpackage.zip. These files when using the correct switches on your build, will be generated each time. if you open up the parameters file you will notice it contains the tokens we created earlier. In the root of your web project create a parameters.xml file . You will see in our parameters file we are using an xpath match to replace settings in our web.config file. The scope is basically looking for a database connection string called DefaultConnecction and we are saying that when you find that value replace it with __DBCONNECTION__ we are doing the same with another key in our web.config called MailAddress. Publish your project again by right clicking on the project and selecting publish and then the profile you created earlier. If you know check the setparamters file. You will notice the new tokens we added in the parameters.xml file are also in here. This file automatically updates with these tokens when you run the publish profile and is key to how we can replace variables in our configuration files. You may already have a build for your solution, if so you can alter this build to produce the assets you need for deploying your solution. Below I have setup an out of the box Visual Studio build pointing to my solution however I have added some arguments to my build. 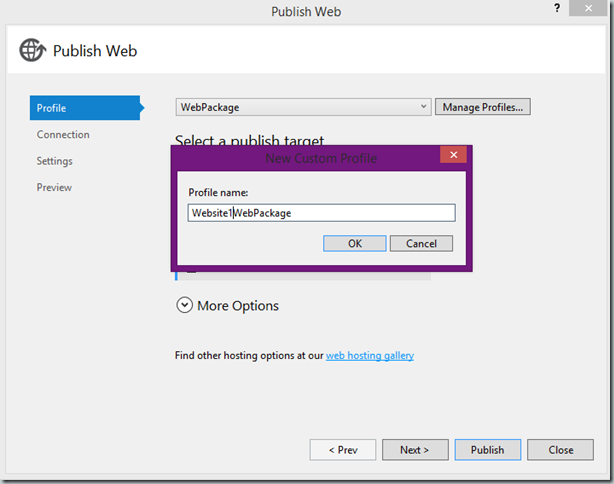 Note above that our publish profile is set to the one we created earlier in the tutorial when we prepared our ASP.NET project with a publish profile we called it “Website1WebPackage”. We are also telling MSBuild that we want it to create a package for us and that we want everything to be in a single file. Click on the Copy Files to task and in the contents textbox you will see we have two entries. We are telling this task that all we want from the finished build is website1webpackage.zip and the website1webpackage.SetParameters.xml file we covered in the earlier steps. These files are automatically generated by our build after we had setup a publish profile on our build to create them in the earlier steps. Run your build and at the end of the build if you look at its artefacts you should have the following files. We will use these in our release to help with tokenisation. Go into Release Hub and create an empty release. In this example I am using the build I created in the previous steps. 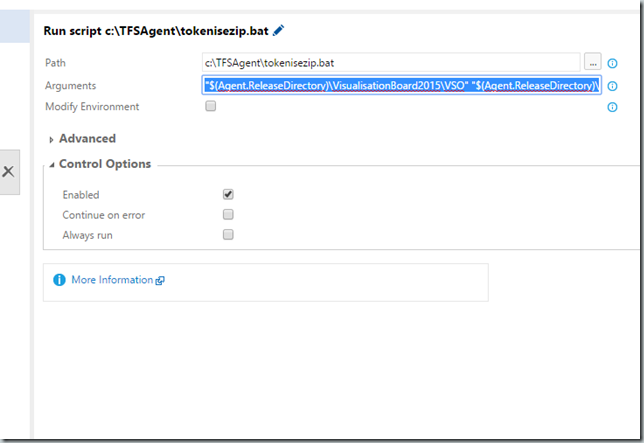 If you don’t already have it, you will need to go to the VSTS market place and select a Tokenisation task. I like to use the following https://marketplace.visualstudio.com/items?itemName=TotalALM.totalalm-tokenization but there are several more you can choose from. Add your tokenisation task. In mine I have set the working directory of my solution as the target path using the following VSTS token $(System.DefaultWorkingDirectory). I have set the Target Filenames to the SetParameters file that our build we created in the previous steps is generating. In the environment I was working we weren’t allowed to use Windows File Copy as it was considered insecure. However we did have WINRM available to us. Provided you have PowerShell 5 installed it is possible to copy files from a PowerShell command line to your destination server. You can skip this task and use the Windows FileCopy task if this is open on your network. In my example I have done just that using the PowerShell task. The PowerShell I use is below and tokenised by variables stored in VSTS in the variables tab. In the example I am using the package files that were copied to the web server in the previous step. Remember those tokens you setup in the previous steps? Now is the time to start giving them values. Click on the Variables tab and start putting some entries in for those tokens. You will also notice that the username and password we use in our release tasks are also stored here and we can refer to them as $(username) or $(password). 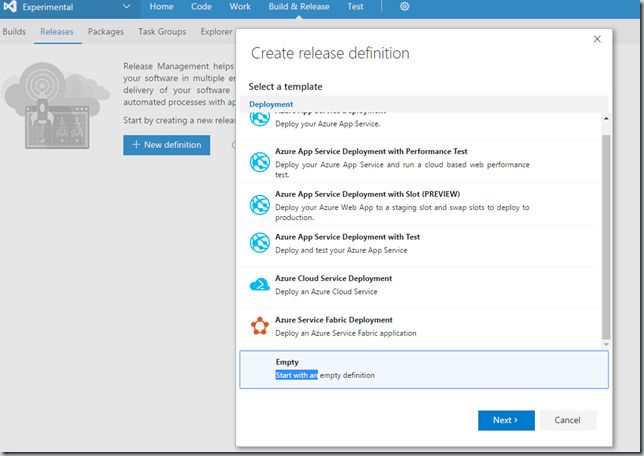 You should now be able to run your Release and deploy. If you have more than one environment, you can clone the existing environment and then replace the server names with the next environments server names. I ran across this error when installing a new Release Agent and it got to the Azure File Copy stage. Many of the solutions on the Internet to this problem point to it being caused by incorrect times on the Agent machine or the target server. However all servers had the correct time and were in the same time zone. My problem appeared to be caused by my token Endpoint from VSTS connecting me to Azure. When I renewed this endpoint certificate the Azure File Copy task magically worked. The only difference I could see from the previous agent I had, was that my new Agent was a new Virtual Machine compared to the older one which was a Classic Azure Virtual Machine. I started using Microsoft Fakes for some code I was not able to encapsulate and use Interfaces for (my preferred approach) . One of the issues I had was the documentation didn’t appear to be all that good compared to the wealth of information available for RhinoMocks and MOQ especially around Instance methods. Here is my scenario. I was calling an external class from my code and wanted to test some code that handled an error if the code was called on the second attempt. In Rhino Mocks or MOQ this type of expectation was very easy to code but with Microsoft Fakes the majority of examples appeared to be around static methods. I knew you could use the AllInstances method for all Instances however I was not clear how I could have an instance do something different when called the next time. My approach was to store the amount of times it was called in a variable and then do something based on that variable count. Anyway to cut a long story short here is my approach. This approach works well for me. Basically on the first call I want data to be returned and on the second call I want to raise an error to check that my code can handle this type of error correctly. I must also point out that this method I am shimming uses async calls hence the Task.FromResult and Task.FromException being used. I am not entirely sure if the above is the best approach to use however I was unable to find another way I could use an instance method in this way. We’ve been on the preview of “Release” for a while now and have been using it for several deployments. Its a great product when you have figured out how it works and as the documentation improves this should become easier. 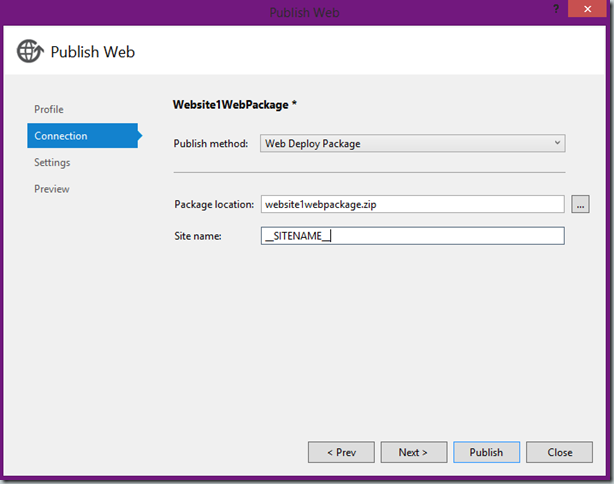 Currently we are using Release to publish the same ASP.NET MVC web application to 3 websites with different parameters in each config (replaced with tokenisation) and to drop a packaged version of our web app for download from an external website. Sounds pretty cool doesn’t it? Well it took a lot of getting around and I am keen to hear back from anyone who may have better ways of handling the configuration file part. Much of what we have done so far has been trial and error mainly between my colleague Richard Erwin and myself. 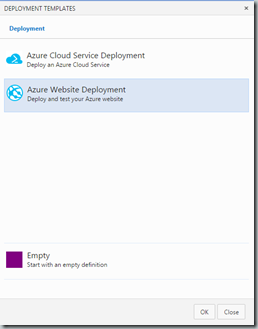 In this article I will cover deployment to an Azure website. In a later article I will cover how we deployed to an IIS web server hosted on an Azure virtual machine followed by wrapping up software for download from your website. Just as a warning we use a self hosted Release Agent to do our deployments and this example will probably only work with a self hosted Release Agent. For the purposes of this article, I forgot to add that we made use of the Custom VSO-Tasks for Zip, Unzip and Tokenisation which you will need to install before hand. In the image above you can see the steps involved in Release. Uses a parameterised xml file with tokens to replace the parameters in your web.config (or other configurations files). If you have done all of the above and just want to get to the Release bit, scroll down to Setting up Release. As you can see in the image below I have a parameters.xml file in the route of my MVC application if you have not used this type of file before you can find out more about it here. 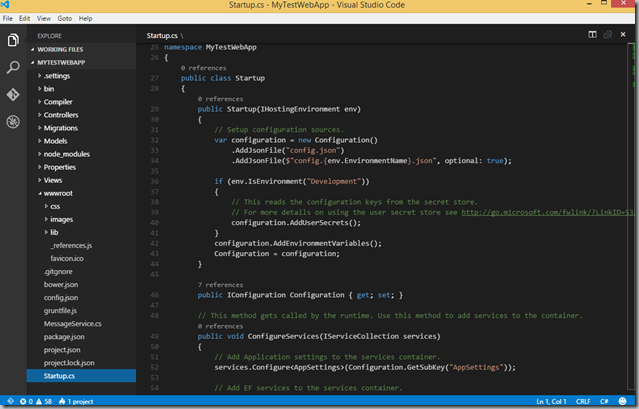 Its a pretty standard part of MSDeploy which is what you are using behind the scenes. The only difference in our file is that we have replaced the default values with tokens. Tokens are represented with the following syntax __MYTOKEN__ . These tokens will be replaced later by a process in a our Release workflow. We are basically telling this file to replace the parameters (represented by the match statements) in our web.config and visualisation.config files above by the defaultValue which in this case we have placed our token in for replacement later by Release. 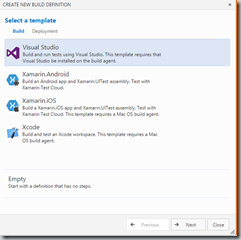 Create an MS Deploy zip file as the output of our build. On the “Visual Studio Build” Step select your solution (you will be prompted to locate this in TFS version control (or GIT) when clicking the button with the 3 dots next to the option. The DeployOnBuild and WebPublishMethod arguments tell the build to create the MSDeploy packages for us. This is simply a zip file that MSDeploy can use to deploy to an IIS box or an Azure website. 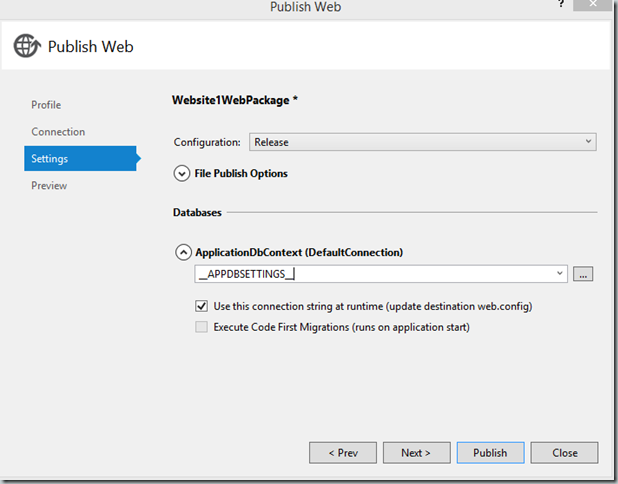 For the purposes of this article I am doing an Azure Web deployment first but will follow up with another article that will go through IIS deployments. You will need to install the Custom VSO-Tasks for Zip, Unzip and Tokenisation before continuing. This article makes the assumption that you have at least some familiarity with Release. In this section we are using our own release agent installed on a virtual machine. A release agent is basically the same concept as how a build in VSO can have its own agent that you can host yourself instead of using the hosted build agent. If you do not have your own Release Agent setup there is a guide here on how to do so. You basically run a PowerShell script on a machine you wish to act as your release agent. If you are experimenting you can even use your own desktop or laptop as a release agent. Release Agents will need Internet access and be located where they can see the target environment you are deploying to. 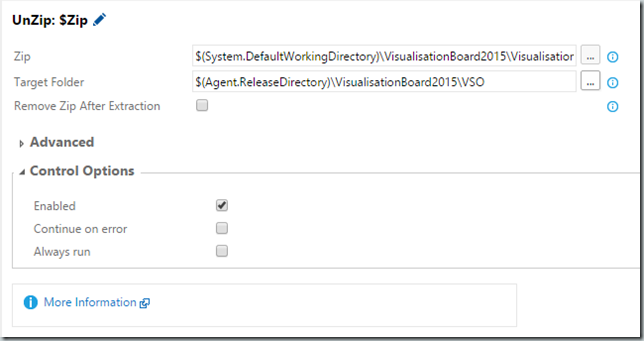 Go into your VSO project and select the Release tab. 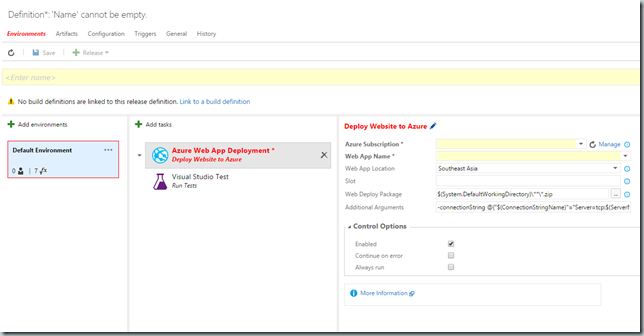 Create a new Release in this case we are doing an Azure Website Deployment. The default release you will see only has two tasks inside it. For the purposes of our setup we had no need for the Visual Studio Test which can be deleted. In our release we added the following tasks (see the image below) which I will go into more detail below. Its a good idea now to set your environment to use your hosted Release Agent if you haven’t done so already. You can do so by clicking on the 3 dots next to the environment name and selecting Agent Options and setting the Default queue to your Release Agent. 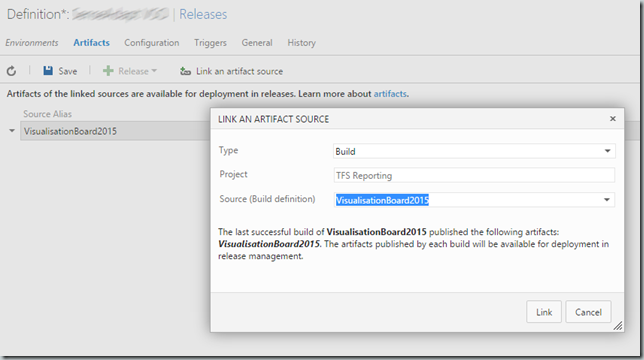 To select the contents of the vNext build you created previously select the Artifacts tab and select “Link an artifact source” button. Basically you are releasing the contents of a build. Select the Environments tab again and Add a task this task will be under utilities and be called UnZip. You can drag this task to the top of the list by holding down on it with your mouse. In your Unzip Task you can select the zip file that is provided by your build output (this is the step we did previously in creating a build above). The output of our build is a zip file used by MS Deploy. We are just telling the Unzip task to unzip this. Note you will have to run at least one successful build to see the contents of your build using the navigation used by the 3 dots button next to the option. The target folder is a folder on our build agent. The above path comes from clicking on the 3 dots next to the target folder. In this case I have only gone one folder deep and placed my own folder name in there called “VSO” which the zip task will create and unzip the contents of the package to. 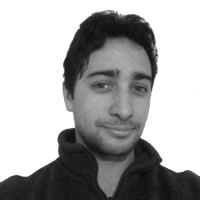 Add a tokenisation task in the same way you added an Unzip task above. Remember the previous step we did above “Custom Parameterized XML file with Tokens”? All we are doing is telling our Tokenisation task to find that parameters.xml file we created in that task in the folder that was created in Unzip task above. This task will replace the tokens in our parameters.xml file with our custom variables (you can read more about where to set these further down). This is probably the least elegant part of my solution and I am open to any suggestions people might have to improving it. In order to make the MS Deploy package work again we need to zip it up, unfortunately we can’t just use the Zip task that is available to us as MS Deploy will for some reason ignore any zip file that was not created with MS Deploy! To get around this we had to install MS Deploy on the build agent box (this is why I am using our own build agent). This batch script task basically tells Release to execute the batch file located on my build agent server with three parameters. The script is listed below and lives in a path on the build agent indicated in the image above. The name of our IIS website. It uses these to recreate the MSDeploy package for us again. Note arguments are separated by a space and each argument is placed inside quotes. 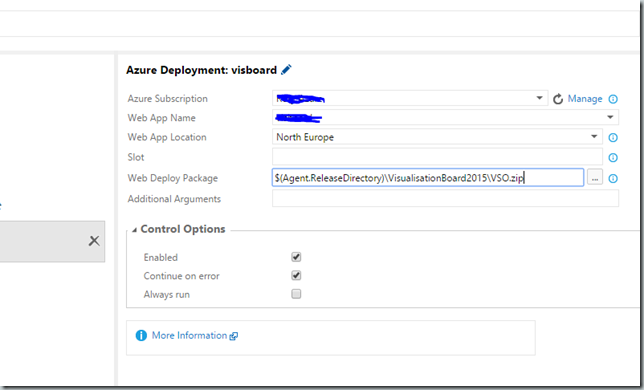 Note if you are unsure how to setup your Azure subscription and website on the Azure deployment task you can find out how to do so here . 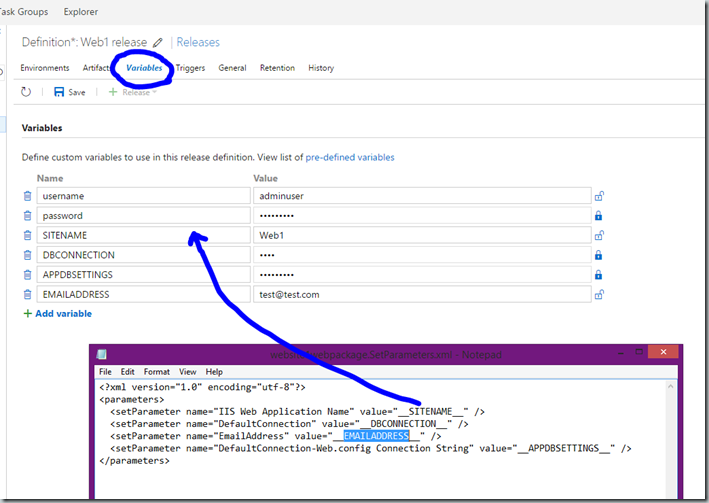 If the Azure web App does not exist Release will create it for you. Where do I put my parameters for tokenization? While still in your Release click on the Configuration tab. This is where you enter the tokens you wish to replace in your parameters.xml file for example the parameter __AUTHENTICATION__ is simply represented by the name AUTHENTICATION without the underscores. The tokenisation task will look for these here. The tokenisation task will also check your environment specific variables which can be found on each configured environment. The beauty of this is that you can have a different set of variables per environment. Once you are done you can now kick off a Release and see if it works! We have found when trouble shooting release. It helps to have access to the Release Agent machine you are using so you can see what is happening in its working directory. Usually an issue could be down to mistyping a name or getting a directory path wrong. I am keen to hear back from anyone who has a better way of using release for tokenized website deployments. Recently I have been doing a lot of coding, and we’ve been working on some exciting things at RippleRock from Lean Coffee Table, TFS Rippler and some advanced HTML 5 charting tools. Our working atmosphere at RippleRock is pretty relaxed with a good work-life balance. As our consultants are usually spread through out the UK (and even some parts of Europe and occasionally India), we make a lot of use of technology to stay in touch with each other. We are all very driven and passionate people about what we do which also makes working remotely from each other (when we need to) much easier to do. The morning ritual is very much the same as a co-located team, we have an early morning stand-up. I personally feel that the day hasn’t started properly unless we have one of these. One of us will open our task board and display it to the rest of the team and we will talk about what we have done and what we will be working on next. We stay in touch using Skype for Business, Skype or Google Hangouts depending on what works best for our situation. Skype For Business is our go to app for remote pair coding. It enables either party to take control when working together. The developer who has control of the keyboard listens to the observer who directs. We can switch control by giving the observer control using Skype for Businesses “Give Control” functionality. We don’t always Pair Code when working remotely as it can be quite taxing being on a remote call for several hours, however as a team we can spot bits of work we believe will be better worked on while pair coding and when we do this, we end up with some very good results. Because constant feedback is so important we focus on small chunks of work that are regularly committed to source control, run in our CI build and deployed to a server. This ensures we have constant feedback for our morning stand-up's. This also encourages us to try things out quickly if we are unsure on what is the best approach, because our feedback loops are so short we can afford to fail quickly and this way choose the best solution that works. This pretty much works in the same way as co-located teams. Sometimes we pair when going over code if we need to figure out what was the idea behind some decisions. Other times code is changed and shelved as a suggestion to the developer who is having code reviewed and they can look over the suggested changes, compare and incorporate them to ensure they understand them. A shared remotely viewable board of work. Any kind of web based board be it TFS, Jira or LeanKit will help here to make work visible. Source Control basically goes without saying how important this is. Remote conferencing tools like Skype, Skype For Business or Google Hangout are important. Those that enable remote desktop control are even better. CI Builds kicked off after check-ins provide a fast feedback loop. Wiki or central document area. We find a Wiki for quickly jotting up helpful documentation essential and it encourages use because of how easy it is to use. I wrote this article more as a reminder to myself on the process I need to go through to make a web application written in ASP.NET (MVC) that uses the TFS API to actually work. I have done this several times now but keep on forgetting some of the key information. Some of the errors you may get if you haven’t set this up correctly are. Error HRESULT E_FAIL has been returned from a call to a COM component. 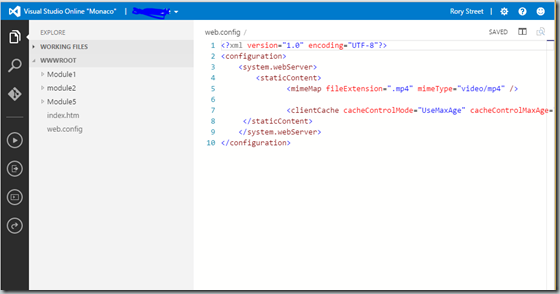 There are two things you need to set correctly and they are your Web.Config and IIS. The first port of call is to setup the following in your web.config. Basically we are saying we want to use Windows authentication in our app and to turn on impersonation. The rest of the settings are dealt with in IIS. In IIS click on your website and then select Authentication from the Features menu. Set these to the following (as per the image). Basically ASP.NET Impersonation, Windows Authentication are set to enabled. Anonymous should be set to Disabled. Scroll down to Process Model and find an identity section. This for a newly created app is usually set under the App Pool Identity account. This needs to be set to either a domain account that has access on the box or I have seen the local system and local service accounts also work here. However I believe this is only the case if you have set TFS to run under one of these as a service. In my case I have used an AD account that has access to the box. The next important step here is to set “Load User Profile” to true. Setting this appears to be critical especially when working with the WorkItem Tracking Client. I believe it needs to create a cache on disk when it does this. Not setting the Load User Profile may prevent it from doing this. This post is more for my own reference as I spent a bit of time trying to figure this one out. For a long time now you have been able to choose your own Team field in TFS and let TFS know this using the following method https://msdn.microsoft.com/en-us/library/vstudio/dn144940.aspx . I was recently working on an application where I needed to know the Team Fields name programmatically. Below is the code I used to do this. I am sure the above code example can be tidied up and adapted a bit more. I would imagine that this is intentional so users have an online and offline version of the editor. 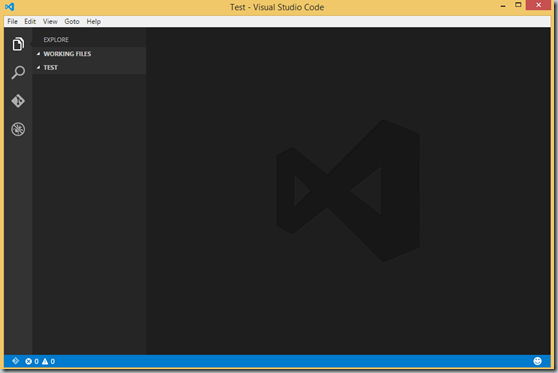 To get started with development Microsoft have some tutorials setup specifically for Visual Studio Code. 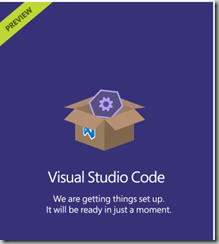 You can get started with a ASP.NET 5 app in Visual Studio Code using the tutorial found here. As Visual Studio Code is so light weight all scaffolding for your projects is done from the command line. NodeJS will also need to be installed which will install npm (the package manager for Node.JS) if you haven’t used npm before this, its not that clear from the tutorial. After you have followed the tutorial you should have a scaffolded project you can view in Visual Studio Code. If you don’t want to go through the above tutorial you can always create the project in VS 2015 and then view it in Visual Studio Code. What I like about this and saw quite a lot of this mentioned is how Microsoft is embracing other initiatives instead of reinventing the wheel and making everything the “Microsoft way” as they have previously done in the past. Editing code in Visual Studio Code is a breeze and I quite like how light weight it is and if you have been using Monaco it shouldn’t seem too different to you especially the integrated Git access. You can also launch kestrel (the web server) from the command line. However while I was able to get most things working with Visual Studio Code I was unable to get Debugging working for my MVC application. The documentation does state that debugging is not yet supported in Mac OS X and Linux although I was using a Windows machine at the time. 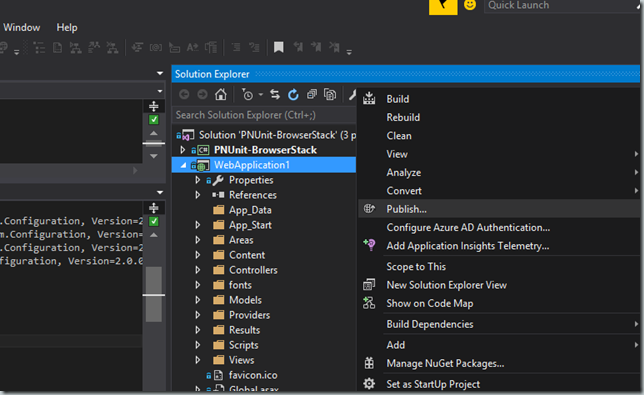 Checkout this excellent article by Mark Rendle on running ASP.NET 5 with Linux and Docker.